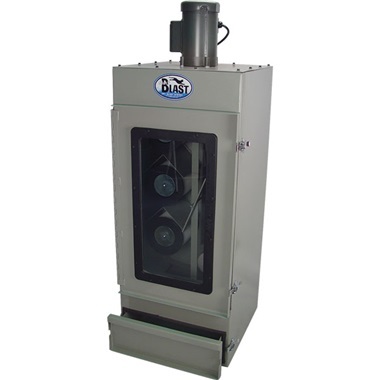 Commercial-Grade Made-in-USA Top-of-the-Line Dust Collector Pulls 600-650 CFM! Patent Pending. 24-1/2"W, 24"D, 58-1/2"H. Ship wt 275 lbs motor freight. Unload or Liftgate Service is available for this equipment (extra cost, in addition to freight adder). Click on Unload or Liftgate Service in suggestions below for details. • PATENTED HEPA FILTRATION traps ultra-fine dust particles down to 0.3 microns and keeps 99.97% dust inside the dust collector and out of your shop. • DUAL TRIPLE BANK HEPA FILTRATION (6 filters) has 225% larger filtering area than older bag-style units. 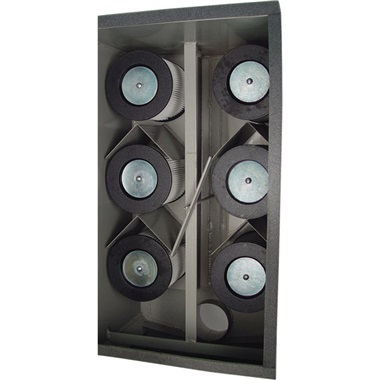 The result is 40-45% more airflow through the cabinet and dust collector, increasing visibility and dust collection. • NON-STICK FILTER MEMBRANE - resists clogging. Most dust simply falls off filters. To clean, shut unit off, shake down filters with shaker lever on rear of unit, then empty drawer. HEPA Filter Cartridge (USA) for 180-DC & 310-DC. Also fits Vac-50, 45 & 40. I changed becasue the other one was plugged, and this one is an exact replacement. I was going to try to "cheaper" one but I don't use very much, so cost not as important. Good filter! We love TP Tools! High volume cylinder head shop. We've worked our TP vacs hard for years, and they haven't let us down yet.